Hello Rubber Cafe fans! It's Amber here, today I'm sharing a fun little Birthday card. 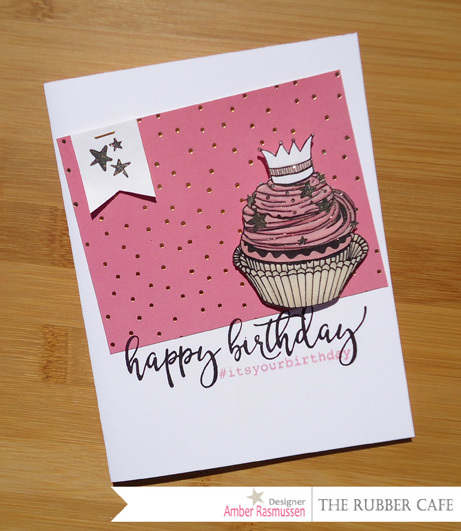 I used March's Kit Of The Month called Special Celebrations plus the add on stamp set called Little Cupcake to create today's card. I started by folding an 8 1/2" x 5 1/2" piece of white cardstock in half to create my 5 1/2" x 4 1/4" card base. After I had my card base created I cut a 3" x 3 7/8" piece of patterned paper from the 6 x 6 paper pad and stapled a small little stamped banner to the upper left side of my patterned paper with a mini stapler. I made my little banner by hand but you could die cut one if you have a banner die. The little stars I stamped on my banner are from the #EatCake stamp set. I attached the patterned paper panel to my card base at a slight angel and stamped two of the sentiments from the Little Cupcake set right below it. 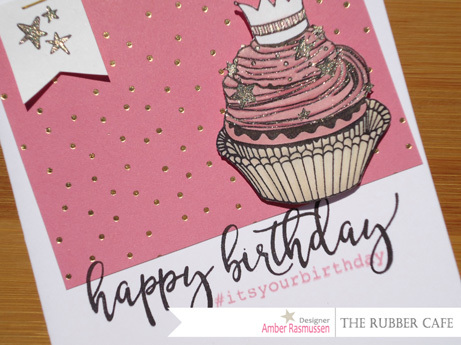 I stamped the larger "Happy Birthday" sentiment in black ink and the smaller #itsyourbirthday sentiment in pink. I stamped the cupcake with the crown and stars onto some white cardstock, colored it with some markers, added some gold ink, and fussy cut it. I attached the colored cupcake to my card base towards the right side above my sentiment with some foam dots. I hope you enjoyed my card! Thanks for stopping by today and don't forget to scroll down and check out what the reset of the DT has been creating and sharing.